We often say that the free government cell phone business is shooting upward. 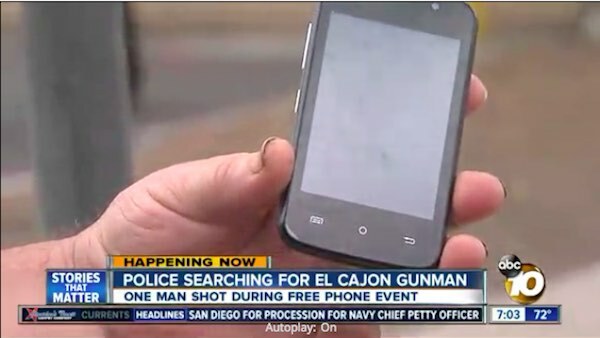 But in this story from El Cajon, California there was an actual shooting. According to police, a group of people were in a booth outside of a resource center handing out free cell phones as part of a government program when two men approached and an argument ensued. A fight broke out and spilled into the street, then one of the men that had approached the booth went to a nearby vehicle, grabbed a gun and began shooting into the crowd, police said. One person was shot, but when police arrived the fight was over and the victim was long gone. Officers later discovered the victim had turned up at a local hospital. Another person was treated at the scene for a minor injury. The two suspects remain on the loose. Police are looking for a black sedan in connection with the crime. If we’ve said it once, we’ve said it a thousand times: Enrolling for a free government cell phone at a street tent or booth is a bad idea. Of course, we were referring to the fact that so many cases of fraud and abuse originate at these venues. But this story offers a completely new reason you should take our advice and enroll online or by phone. We make that as simple as possible by providing customer service phone numbers and web addresses for every free government cell phone service provider. You can find all those companies and all their plans offered in your state on our convenient “States” page. Just click here. I lost my phone and I want to stop service. Contact your service provider’s customer service team, Clifford. You’ll need to ask a friend or neighbor to help you enroll, Miranda. You can also try calling (if you can borrow a phone) customer service to enroll by phone. My son and I each applied for and received Ca.Lifeline service through your, company and each of us bought a ZTE phone from a street vendor. The vendor is now not to be found and neither of the phones work.We wer informed that the phones are refurbished or counterfit and we can,t use the service Please advise. Jesus Freakin’ Christ, Ward. How many times do we have to say that we are NOT a Lifeline free government cell phone company? This is an independent informational website. And how many times do we have to say NOT to enroll at a street event because of fraud and abuse? Sorry for getting pissed, but we have responded to this same question from about 10,000 readers. All new customers receive smartphones. We would like to have our own personal valet. Luckily, you can enroll with the free government cell phone provider of your choice. Unluckily, there is no website called FreeGovernmentValet.net to grand our wish. We have not done that calculation, Donald, but a little Googling will probably lead you to the answer. Not a clue, Melinda. This website specializes in the Lifeline free government cell phone program, not in cell phone repair. Where do I go to get a free phone in Santa Maria California 93458? Ahhhh, lovely Santa Maria. San Luis Obispo used to be our stomping grounds. But back to your question. We strongly urge our readers NOT to enroll at street events because they have been the scene of so much fraud and abuse. You’re much better off enrolling online or by phone, Alex. The Gov. Phone n I had (vortex 8) was stolen. My emails were going off as if something bad happened. You can only get that done by contacting your service provider’s customer service team. You need to speak to your service provider’s customer service team ASAP, Angela. Why was your previous phone cancelled? What’s the specific issue you’re upset about, Brian? My question is: What must I do to remove my vital information from one of the “Gov’t” cell phone providers? I need to have my information removed/deleted from QLink Wireless. I DO NOT have nor want phone/service from QLink Wireless. I wish to find phone/service with another, more reputable company. Are you saying you want to switch service providers? How would we possibly know if you qualify for a phone, Mary? We don’t know who you are. We don’t know what your financial situation is. We don’t know where you live. You need to contact your service provider’s customer service team, Dawn. I need other smartphone with a private number and if u could send it to me I get food stamps and I’m on ahcccs please help out thank u. We have no idea what company sells a global card, Sheila, so we can’t help you. Contact that company. Did you apply for a free phone? Read this website, Shakila. It will tell you if you’re eligible, and if you are, how to enroll. I was approved for a free phone a while back. I still haven’t gotten the phone. why? I don’t understand what the delay is if there was something else I needed to do they should have told me. I don’t know what else to do please send me my free phone I need it I’m on my cousin’s phone right now and she needs it back I made this free phone my number is 704-795-****.it’s been a long time now. Please please send my smartphone. How long ago did you apply, Lucretia? Which company did you enroll with, Lucretia? You need to call that company’s customer service team to get your questions answered. Smartphones became mandatory on December 2, 2016, Glenda. Have you opened a new account since then? If so, you should have received a smartphone. I filled out Qlinks website and they state THEY don’t offer ANY service in Iowa, but your site say’s they do,What’s up? The entire Lifeline program has been in a state of flux recently, Reverend. There have been mergers, companies leaving the business, etc. We’ll check into this and get back with an accurate answer. I lost my free safelink phone. I called the 1800 safelink number but I cant talk to a real person. I need to talk to a real person, not a recorded message. What is the number I can call to talk to a customer service? I want to have a replacement phone but I want to buy the smartphone they now offer. If you’re an existing customer, please provide us with your SafeLink Wireless serial number or your SafeLink Wireless phone number when contacting us so we can give you the best possible service. I’m having problem with my cell phone and I call and they told me to buy one and then to call back to give me the info to put in the phone what I have to do?? I do have the free government lifeline..
Did you do as they said and call back to speak to customer service or tech support? Did you purchase a cell phone that is compatible with your service provider’s cell network? Most free government cell phone companies say two weeks, Lenora. But based on what our readers say it’s probably more like three or four weeks. One unfortunate reader told us it took six months. We hope you’ll have a better experience. Unfortunately, with some of these companies you HAVE to sign up on the spot, because that is the only way they do their marketing but if you are suspicious, go home and contact the company to be sure it is legit. I live in Virginia, I was issued an Android 3g ZTE. I was able to use Google. Not working now. Can’t change voicemail either. Please help! #804_878_****. Assurance. Contact your service provider’s customer service or tech support team by phone or online. There are countless examples of fraud, Dan. Several companies have been charged fined substantial amounts of money because their agents did not follow the rules. Search around this website and you’ll find a number of stories.